Could Ohio's Renewable Energy Be A Matter Of National Security? It’s been years in the making, but this month plans for a Lake Erie wind farm took a step, or at least a half-step, forward. 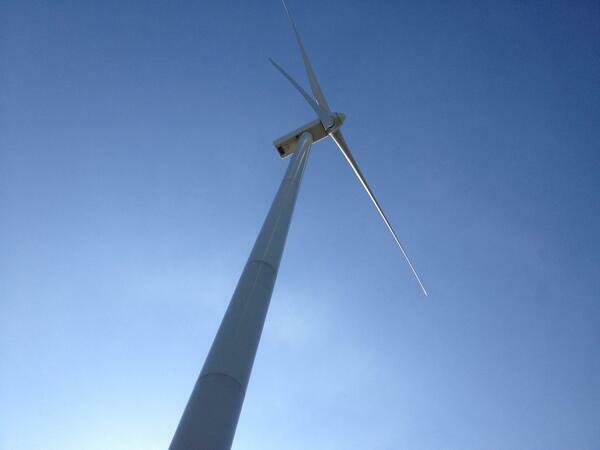 The staff of the Ohio Siting Board conditionally approved plans to put wind turbines eight to 10 miles offshore. Developers would have to monitor danger to bats and birds from spinning turbine blades, for example, if the site is to run at night. This project is not without opposition, but the discussion around renewable energy projects and infrastructure in Ohio is ever more robust. And that could be very good news for manufacturers. “We do a lot: building products, led lighting components, and solar, those are the three major verticals we’re in,” says Steve Peplin, CEO of Talan Products in Cleveland. Peplin says he started with three guys and $2,100 in 1986, and now his million-dollar machines are manufacturing components for many things, including solar mounting systems for rooftops. Peplin says Talan makes the mundane stuff that everybody needs, but nobody thinks about. Peplin says Northeast Ohio is definitely still positioned well to manufacture and compete in the renewable space, because it has a number of qualities going for it. “We have the infrastructure; we had until recently low-cost industrial space—it’s still low-cost compared to California or the East Coast; a history and a heritage of manufacturing, so we have the infrastructure, steel mills located here; and we have a great labor force,” Peplin says. Another advantage? Location. Ohio is often touted for its geography, making it a logistics center for everything from Amazon packages to orchids. Steve Peplin of Talan Products inspects some of his goods. There could be as many as 100 Northeast Ohio companies that serve the renewable energy sector, according to a rough estimate from Wire-Net, an economic development non-profit tied to manufacturing. And while this may just seem like another business story, some experts think this should be also be a national security story. “We believe that America’s economic strength is essential for America’s overall security. It’s as important, easily, as the military strength of the nation,” said Vice Admiral Lee Gunn. Gunn serves as vice chair of CNA’s Military Advisory Board, a group made up of retired three- and four-star generals and admirals. “The opportunities in terms for America in terms of technology, in terms of manufacturing capacity, those opportunities that are resonant with transition to advanced energy mean that American can seize the high-ground on this, America should seize the high-ground,” he said. Gunn visited Northeast Ohio as part of a study group from the Atlantic Council, talking about energy in terms of national security. The group learned about manufacturing (with a stop into Talan Products, for example), but also held conversations at the Cleveland Clinic, before participating in a City Club discussion on the same issue. The “we” also included General James Jones, who among many accolades is a former Supreme Allied Commander Europe, a former National Security Advisor for President Obama, and is now interim chair of the Atlantic Council. Aluminum and steel tariffs imposed by the U.S. on a number of countries have caused unease among some traditional allies of the United States. The tariffs would make some major projects more difficult, including infrastructure upgrades. There would have to be capacity and domestic will to refocus priorities. “In my view, we don’t have a choice,” Jones said. “We do have a significant decaying infrastructure in this country that has to be rebuilt. In the middle of the 20th century when everything here was new, and everything everywhere else in the world was old, it was kind of a heyday for American power and prestige, really. Everyone wanted to be like us. Well, in the ensuing 50-60 years they did become like us, and we didn’t pay attention to our own infrastructure. Energy experts say that Lake Erie has the wind energy potential of a nuclear plant, and the state needs to develop those resources sooner rather than later. From a national security perspective, energy concerns include dependence on foreign oil, on vulnerabilities of our electricity grids, or even not needing troops to use noisy generators while deployed, and lighten convoys needing to bring fuel for those noisy generators. Gunn said all branches of the military are thinking about renewable energy. But still, real national security has a lot to do with what happens right here. And that brings us back to Lake Erie, if not the front line of the energy discussion, certainly a shoreline. There are Ohio companies that have been thinking about renewable energy as a major part of their business plan for quite a while, and as that know-how grows, it can start to underpin larger parts of the economy. Cleveland’s Lincoln Electric is an example. It has a long line of welding products, and its priorities include power generation from wind, hydropower, thermal power (burning coal or burning gas) and nuclear power. You may wonder why welding might be vital to high-tech wind generators, but the answer isn’t as complicated as you might think. Welding becomes pretty important when wind energy needs to be as efficient as possible to keep costs low. Angelino says some estimates put the wind energy potential of Lake Erie at 1,500 megawatts, or about the same as a nuclear plant. That’s not to say the Lake will be developed to that level, but it does show potential in wind energy in Ohio, just as there’s potential to plant a bigger flag in solar. Peplin doesn’t know what it might take to further ramp up renewable energy-related business in Northeast Ohio, for the good of the economy or national security. He suggests maybe requiring locally-sourced components for systems, or maybe a beefed-up renewable portfolio standard for utilities. But from his perspective, in the industry, it makes sense from a cost perspective. A long-running project to build a wind farm in Lake Erie has won approval from the staff of a state board overseeing electric facilities. A bill that would overhaul the way Ohio mandates the use of renewable energy and energy efficiency is likely to get a vote in the Senate this week. A study is urging Ohio leaders and policymakers to support clean and alternative energy before it’s too late. One researcher says there’s a ticking clock on the economic benefit the state could harness. Lisa Kenion lives in Euclid, Ohio, right off of Lake Erie. She’s a member of the Moss Point Beach Club, a neighborhood with a private little patch of lakefront property. A group that advocates for the rights of landowners is fighting back against a bill that would allow for more wind turbines to pop up. The bill addresses how far turbines can set back from property lines. But the wind energy industry says those setbacks must be reduced in order for more development.